Why does it say that "Zen" (or any other word) is an invalid word? My tiles are disappearing or I am not getting enough tiles in my rack on Windows 8.1. How does scoring work at the end of the game? It doesn't add up! This is a known bug that I do not yet know how to fix. I believe that it is something strange in Windows 8 where if you keep an application open for too long (even running in the background) then memory seems to get corrupted... Unfortunately, I don't have a fix for the issue. That said, I believe that if you ever see it acting strange, you can fully close down the app by dragging it from the top of the screen down to the bottom of the screen. This will shut it down (instead of just putting it in the background) so that the next time that you open the app it will load up fresh and it should not have those missing tiles issues. How does scoring work at the end of the game? 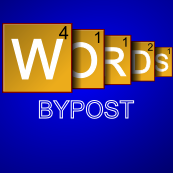 There is a rule in Words By Post that when one player plays their last tile, the remaining tile points on their opponent's rack is added to their score and subtracted from their opponent. With WordsByPost, blank tiles are actually worth 15 points in this situation. If neither player can play at the end of the game, then both players should skip their turns and then all remaining tiles will be subtracted from each players' score and the player with the most points wins. On small screen Android devices you may only see the board and your rack tiles when you first view a board. The trick is to use the d-pad directional buttons on the phone or use the optical scroll wheel at the bottom of your phone to scroll the board up and get access to the submit buttons.